The project applicant is the McIntosh Villas, LLC. The project would construction of 104 residential condominium units in the Laguna Seca Office Park, the removal of 191 protected oak trees, and the widening of York Road. This project is governed by the County of Monterey’s General Plan. An Office Building was approved by the Board of Supervisors in August 2012. The Mitigated Negative Declaration was circulated December 2008 – January 2009. 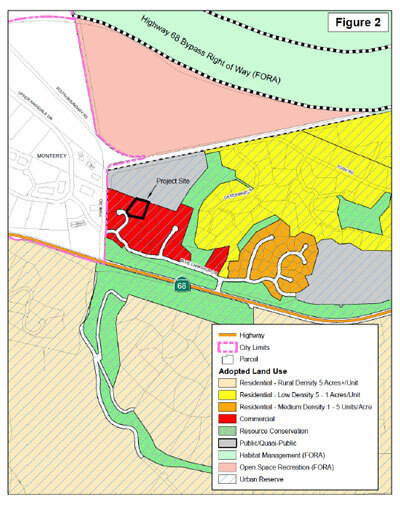 This map shows the proposed Laguna Seca Office Park project. The certified EIR for the Laguna Seca Office Park which was approved in 1983 was based on a total build out of 260,000 square feet of commercial use. The proposed project would exceed the 260,000 previously approved by about 45,552 square feet or almost 18% and change the use from office park to mixed use. The project would remove 216 trees, including 25 defined as landmark, and 191 protected oak trees. The proposed Forest Management Plan would replace only 133. Regrowth of these trees would take years. The consistency analysis for air quality was prepared using out dated population forecasts. The Air Quality Management Plan was updated in July 2008 to include AMBAG’s 2008 population forecasts which are considerably lower than the 2004 population forecasts. The air quality cumulative assessment should be updated using current population forecasts.